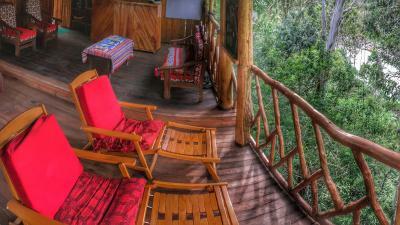 Lock in a great price for Eco Quechua Lodge – rated 8.7 by recent guests! A fantastic place on the edge of a roaring canyon. It felt like being in treehouse but safer. I went during the rainy season and the power went out during a massive downpour but there was still light in my room because they have a small wind generator for backup. The staff are great. I did the Vertikal Zipline and went to the Cocalmayo hot springs, both very near the lodge. Janet and the staff are very nice and you can tell they do their best. The welcoming juice is charming. The common areas are lovely and the free fruit and infusions available are really great! The property and rooms are very beautiful, however the immediate surroundings are not on a good state, but this is not the lodge's fault. In general Santa Teresa is a humble town, so do not expect pristine roads and buildings around. On the other hand it has a charm of it's own and people are very friendly. The natural surroundings (mountains, river, birds ) are very beautiful and peaceful. Plenty of nice activities for a couple of days. Or... Just relax! Food in the lodge is also very nice, and also visit the fantastic near by restaurant Vallesanta! Very warm welcome. 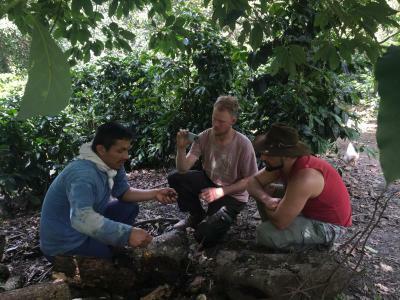 Quiet place, great excursions and delicious food. Highly recommendable! I like services they are very nice people and love how exotic the lodge looks. Breakfast is good but very little. The walk up is well worth it. If you want a unique experience then this is it. Very charming people and great breakfast. I was expecting more insects but all was good if you follow the instructions about bugs being attracted to lights. 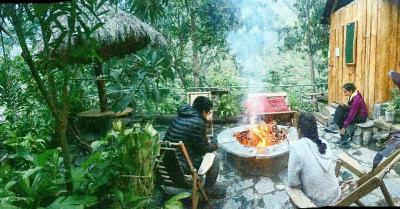 Our hostess made us a fire and we sat around chatting for a few hours. 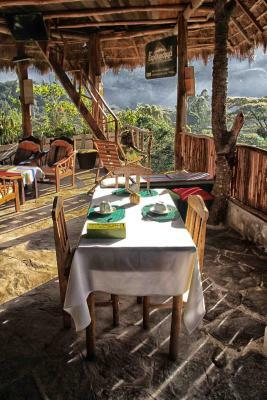 This is my second time coming back to Eco Quechua Lodge and its spectacular view of the mountain range from our room and the dinning area never fails to impress, and to top...a delicious memorable breakfast I would come back for again and again! 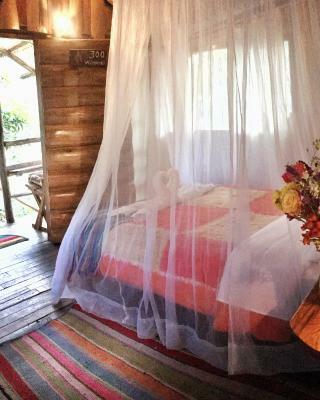 We loved staying somewhere that felt like a treehouse, with a misquito net (although when we went the bugs were not bad) and the food was great every night. 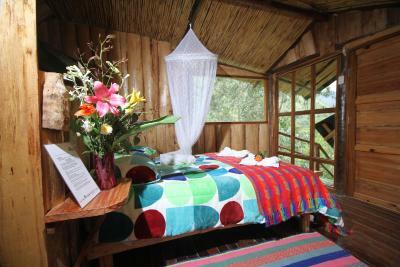 It was a wonderful place to just relax after the business of Cusco and Machu Picchu. We liked that there were planned activities available and to feel at once far from civilization and like amenities (like taxis to the train station and hot springs) were available to us. We could hear birds and the river from our room (which is open) and it was such a neat experience. The staff were very accommodating and provided us with a very unique experience. The rooms were beautiful and very private with an amazing view. The food was fresh and fantastic. 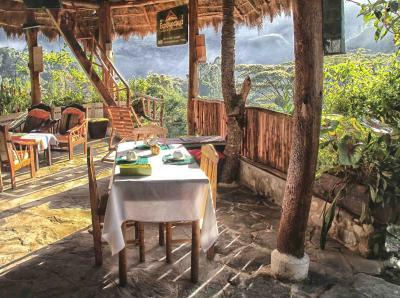 Eco Quechua Lodge This rating is a reflection of how the property compares to the industry standard when it comes to price, facilities and services available. It's based on a self-evaluation by the property. Use this rating to help choose your stay! 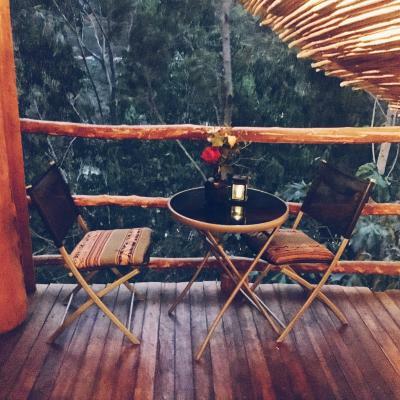 One of our top picks in Santa Teresa.Eco Quechua Lodge is an eco-friendly lodge offering private balconies with river and mountain views. 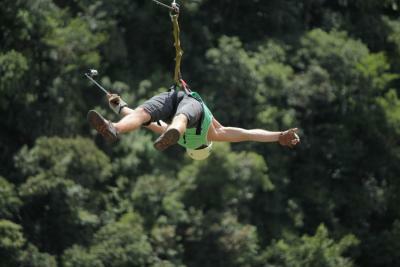 Guests can take canopy excursions and visit indigenous communities with certified guides. 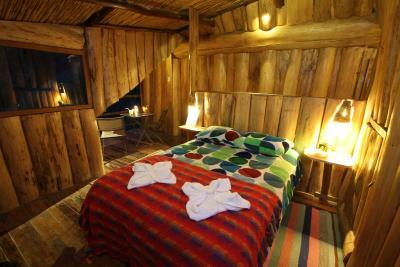 Eco Quechua Lodge is built with types of native wood and features recycling and reforestation programs. 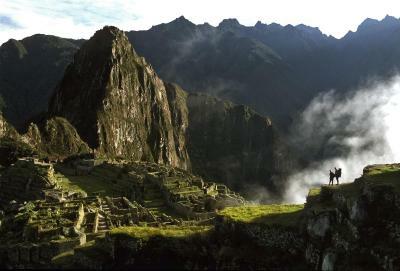 It is only a 1-hour drive from Machu Picchu. 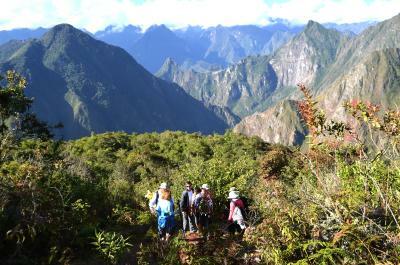 Guests can walk the Inca Trails or book a massage. 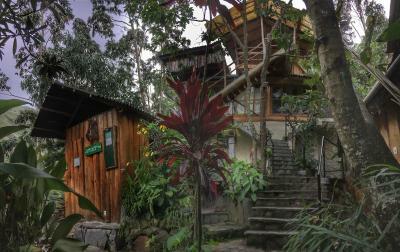 The eco lodge is a 15-minute drive from the Santa Teresa Ruins. 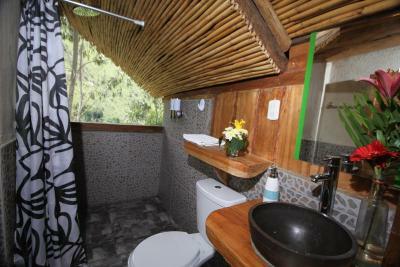 Rooms at Eco Quechua Lodge are equipped with mini-bars, tea/coffee makers and private bathrooms. 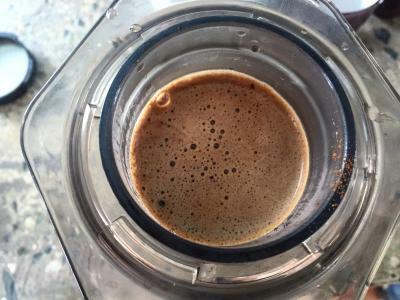 Guests can expect a full breakfast with tropical fruits and coffee. The restaurant offers candlelit dinners and room service. 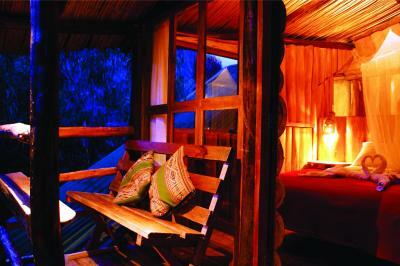 The Lodge offers a handy currency exchange service and private parking for an extra fee. Velazco Astete Airport is 141 mi away. 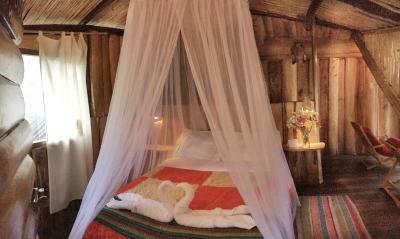 When would you like to stay at Eco Quechua Lodge? 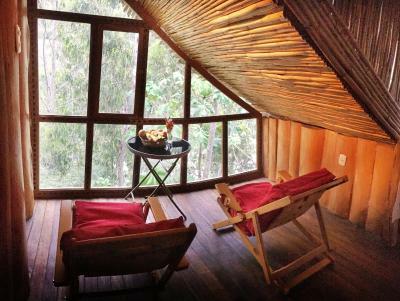 The room features a private terrace with river and mountain views. The room features a patio with mountain views. This twin room has large windows facing the mountains. This double room features a balcony with great panoramic views. 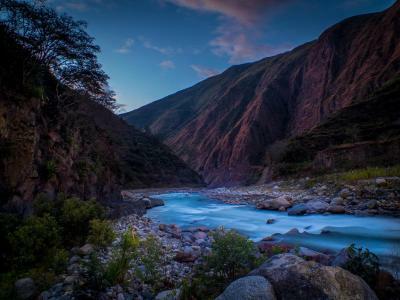 Peruvian Paradise An Hour From Machu Picchu. 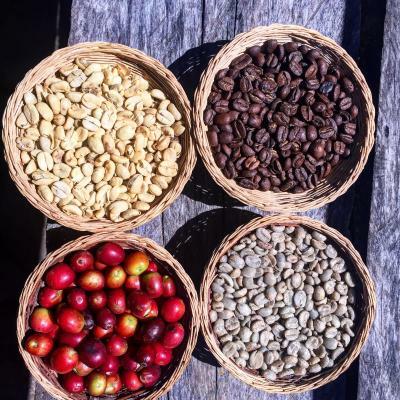 One of Peru's best kept secrets just keeps getting better and better. 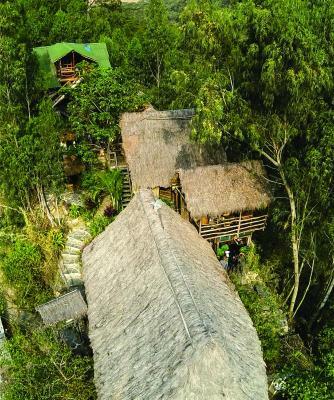 If you're looking for a trip that won't cost a fortune and takes you a bit off the beaten path, look no further than EcoQuechua Lodge, situated in Santa Teresa, Peru, not far from Machu Picchu. 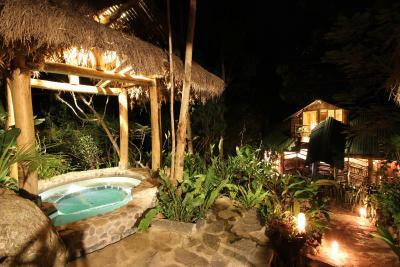 Located in the high jungle, it offers a lovely and tranquil getaway. 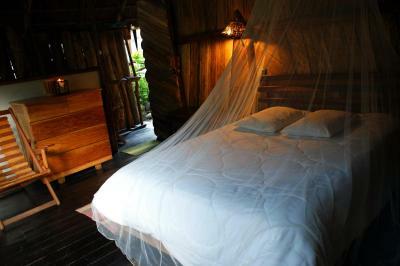 Like a jungle lodge in the Amazon, some windows are open to nature so that you feel like you're part of it all (beds have mosquito netting). There's just something about this place that makes my stress melt away as soon as I arrive. 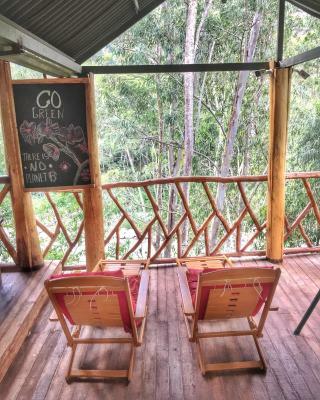 Let me stretch out in a hammock with a good book and one of their awesome pisco sours and I can spends days at a time here, forgetting the outside world even exists. 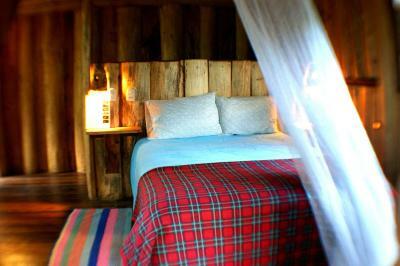 The entire lodge uses natural materials, including wood, rock, and bamboo, and its newest rooms feature private bathrooms. 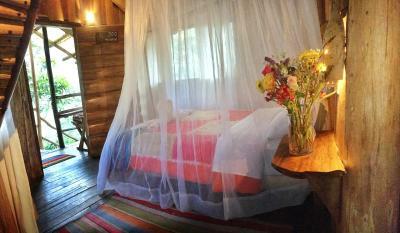 Ever dreamed of living in a grown-up's treehouse? This is that dream come true. 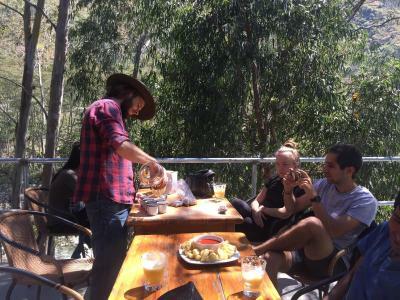 The owners and staff couldn't be friendlier and are genuinely interested in ensuring that you have everything you need and are having the best time possible. 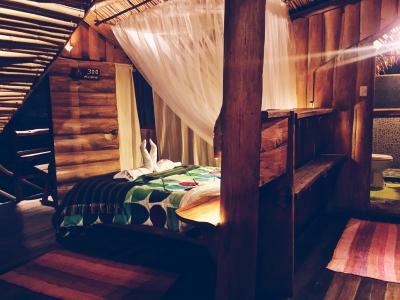 House Rules Eco Quechua Lodge takes special requests – add in the next step! 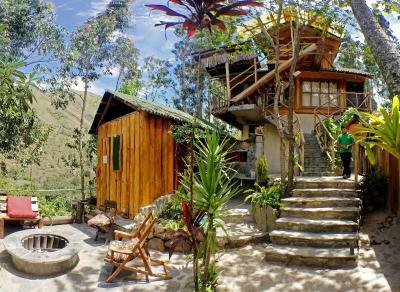 The nearest train station to the property is Estación de Hidro Eléctrica, only a 30-minute train ride away from Aguas Calientes train station. Purchasing tickets for this train a few hours in advance is advised (no internet sales). Tickets can be purchased at Aguas Calientes' ticket stand (formally known as Machu Picchu Pueblo). Upon arrival guests will find various local shuttle services. Traveling by car from Cusco takes approximately 6 hours and is the cheapest and most panoramic option. Guests can find various van services online, or alternatively, book a van service from "Almudena" bus and mini-van station. 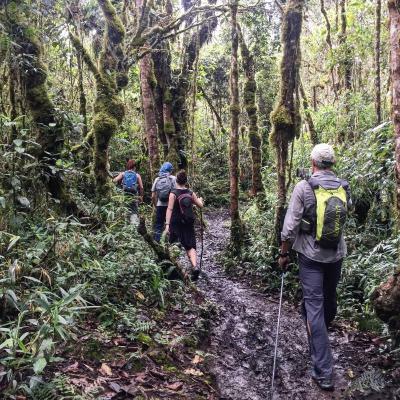 Guests can also take a 2.5 hour walk from Aguas Calientes to Santa Teresa Hidro Eléctrica (hydro-electric plant near the property). 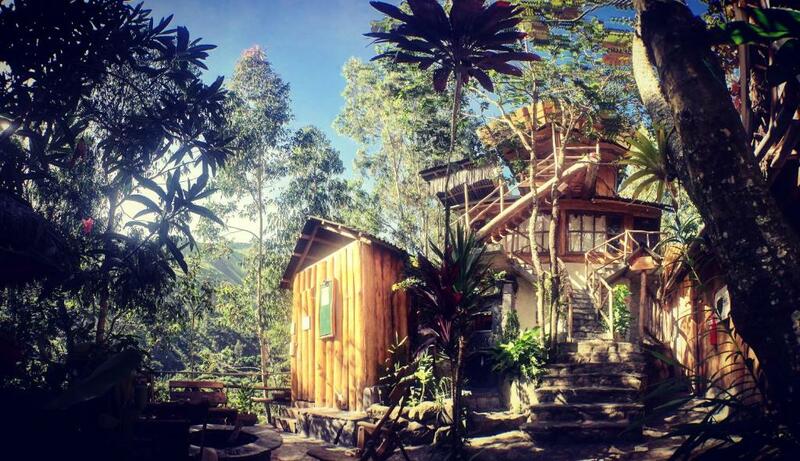 The path from Aguas Calientes to Santa Tersea is visited by approximately 500 people daily. Upon arrival at Santa Teresa hydro-electric plant, guests will find various local shuttle services offering rides to Eco Quechua Lodge. Please inform Eco Quechua Lodge of your expected arrival time in advance. You can use the Special Requests box when booking, or contact the property directly using the contact details in your confirmation. The price did not match our expectations. 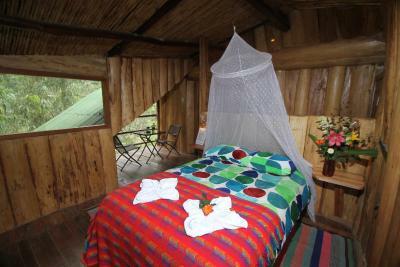 The lodge is a bit improvised resulting in many little problems that are not worth the price. The room was dark and more of what you would expect from a hostel. Even after asking several times we did not have hot running water. The trash from the construction happening in the hotel was in our back porch. I only have 2 little inconveniences to report....1. the WiFi is only in the common areas (and it is slow) which makes it a bit inconvenient for working etc. and the second morning no coffee... not a huge deal for me but for others it may be. It was a little bit more expensive then what I would normally spend but well worth the money and no regrets! Everything from the location (close enough to town but in nature and serenity), the room, the view, to the owner etc was absolutely perfect for what I was looking for. Because is was slow season the restaurant wasn't really open so Janet, the owner, suggested a place in town (about 1/2 mile) to eat and gave me directions. As I was walking there, I was surprised to be greeted by the chef on the street (she walked over half way) to accompany me! I was then blown away at the best Lomo Saltado I've had in Peru! and also the best Frappacino I've ever had. When I was finished they walked me all the way back to the lodge!!! I was seriously blown away at the sincere hospitality from the lodge and the restaurant, Valle Santa is the name of restaurant (neither work for tips btw). 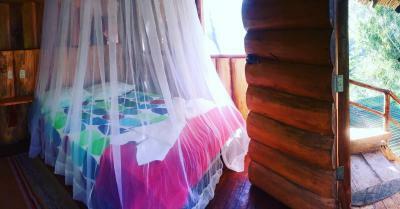 The room I stayed in was a bit like staying up in a tree house over looking the river. Quiet and in the trees, I had the best night of sleep I have had in years. there are many common areas to enjoy and what looked like 2 hot/cold tubs outside (not in function during my stay) and a fire pit. The views were amazing and.... the Colcomayo Hot Springs were only a short, beautiful walk away. (those hot springs are a do not miss btw! Paradise!) I honestly can say if the lodge had a job opening I would have stayed! Absolutely loved it! 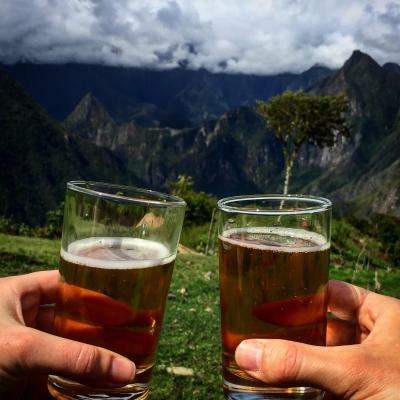 Oh, also... if you are planning on experiencing Machu Picchu by hiking in from Hidroelectrica ... I would highly recommend allowing ample time to take a bus from Cusco or Ollantaytambo to Santa Teresa to do this ($17 gets you one of the most beautiful and exciting drives in Peru.... easily 30+ water falls a long the way!) 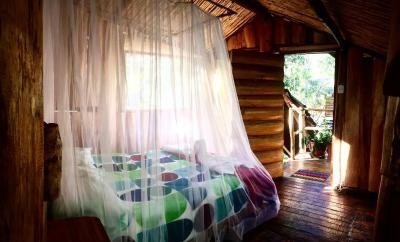 and staying at Eco Quechua Lodge. There was a high pitch squealing sound that got a little irritating. 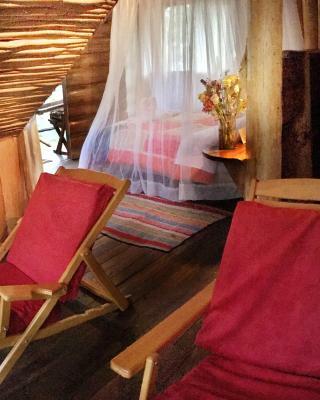 There are a significant number of mosquitoes around (this is nature), but some of the cabins could be sealed a bit better, in any case the bed nets ensure there is no problem during your sleep. One of the staff members was not very helpful in communicating before our arrival. When we asked to order a transport to pick us up at Hidro Eléctrica, as announced in the booking.com, confirmation we were told that they are a lodge and not a "transport company". After that we did not hear anymore from that staff member. Fortunately once we reached the lodge everyone was super friendly and our stay was very smooth. The free fruit was great, the facilities are good and most staff are friendly. I did not like the scary bugs and insects but it’s obviously a jungle so we knew the consequences. What really dissatisfied me is the extra charge per person to use the hot tub which I think should be included in rate that is already expensive. Also the loud rooster that constantly cockadoodling all day long from 4am to night no good sleep at all and dogs barking all day! The town is really quiet nothing really to do that’s affordable there beside the hot spring. 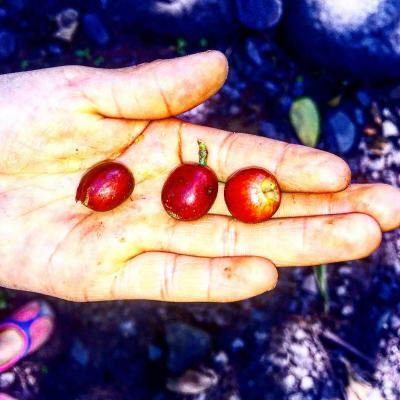 Zip lining and coffee tour very expensive. Beautiful surroundings for a quiet stay. Staff were some of the most friendly and helpful I have experienced. I was so pleased to find we also had the opportunity to take a hot shower since they had changed the heating system since previous reviewers. Kiki and Janet who run this lodge were fantastic hosts and helped us get a deal on the local zip line and any taxis needed for getting to the thermal baths was ordered and there within a short time. I wish we had booked to stay longer at this lodge. One of the most unique places I've ever stayed. The property is a maze of little gardens and patios. Elevated into the tree-tops with the birds. Our room was accessed by a small bridge. 1 wall of screen and glass high above the river below. Sleep to the sound of rushing water. I will be back again and again. Meals were amazing.